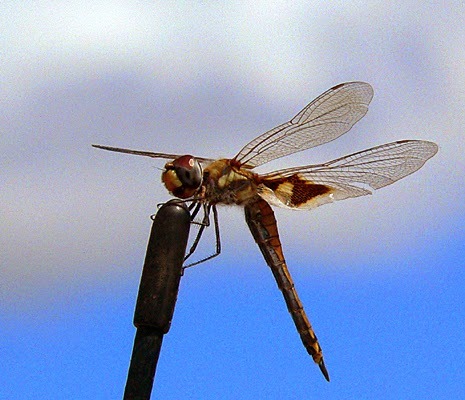 The males of Common Glider Tramea loweii love to survey the world from a vantage point -- in this case a car aerial. 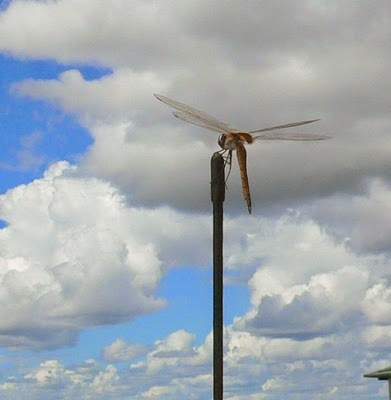 This dragonfly is found throughout Australia. ...although the collective noun is "army". The Logis Royal at Loches has a very interesting special exhibition on the life and times on Francois 1er. My question is... Who stole that lady? Marie-Genevieve-Charlotte Thiroux d'Arconville, the daughter of Guillaume Darlus, was born in Paris in 1720 and died there in 1805. Her father was one of Louis XIV's super rich tax farmers general by the time she was a teenager, but her mother died when Genevieve was only 4 years old, and her early years were relatively austere. Nevertheless, her father ensured she was carefully educated in the arts, although she didn't learn to write until she was 8. She was married to Louis-Lazare Thiroux d'Arconville, President of the Paris Parliament, at the age of 14 and by the age of 16 had their first child. Two more children followed before she was yet 20. Despite this, marriage also enabled her to engage in her lively interest in learning. Mlle Darlus, aged 14, by Charles-Antoine Coypel, Chateau of Cheverny. When she was 23 she contracted smallpox and was badly scarred. It caused her to withdraw from society, giving up all entertainments and outside social activities and dressing like an old lady. She occupied herself with writing and scientific experiments, producing works on history, physics and chemistry. She corresponded with and read Voltaire, Rousseau, Jussieu and other great thinkers and scientists of the day, and received them in her home. She took courses in subjects such as anatomy, one of the first women to be admitted to such classes. She set up a hospice style clinic in a house that she owned, where both paying and charitable cases were treated. At the outbreak of the Revolution she sold the house and was openly against the Revolution, causing a rift with one of her sons. When she eventually published, in her mid-thirties, it was anonymously and for a long time after her death her work was attributed to Didier. Much of what she published was translations from the English (her first was a translation of Lord Halifax's Advice to a Daughter), but she also wrote novels, biographies and autobiographies, moral treatises and original scientific works. Whilst she wished to disguise her gender, she cleverly managed her publications so they were clearly by the same person and formed a body of work which received some critical success in her lifetime. Her first scientific work was a translation of an English language treatise on osteology. In addition to translating the work into French she added 30 drawings of the human skeleton, including a controversial one of a female skeleton. The original author had eschewed drawings, believing that real skeletons must be studied. But Genevieve d'Arconville recognised the value of drawings as providing a bridge for those who wanted to learn but were a bit squeamish at first. She also added explanations and commentaries to the original work, and a table of contents and re-ordered the text so the book was more user friendly. Apparently the original work is quite a modest tome, but the French version is enormous, and in two volumes. 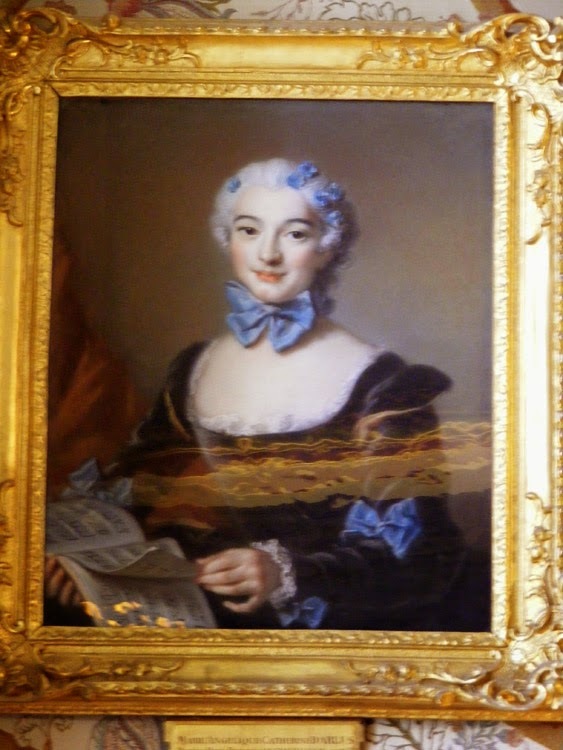 Mme d'Arconville by Alexandre Roslin, Chateau de Cheverny. Right from the beginning she chose to publish anonymously, as she felt there was some social risk for a female in print. The books were published using the name of a male surgeon who she took into her confidence and trusted. Then she moved on to the subject for which she is best known -- the putrefaction of matter. She was interested in two aspects of putrefaction -- how one might preserve food, and what the actual transformation during putrefaction was, how it worked, what caused it. She conducted hundreds of experiments on meat, fish, milk and eggs, following a strict scientific protocol and recorded daily observations. Her laboratory was on the damp ground floor of her country house and had windows facing north and south which she used to her advantage in the experiments. Her experiments, following on from work done in England that she had read and translated, showed that quinine was an antiseptic, but she disagreed with the Royal Society scientists on cammomile being useful as a preservative. She remained one of the foremost authorities on the subject until Pasteur discovered the role of microbes. Her niece married the Marquis of Vibraye and two portraits of Genevieve hang in the Chateau of Cheverny, the Vibraye family home. Steve the Siberian Iris has had his one and only flower bud for this year chewed off by some slimy scumbag of a gastropod. Some of the pseudo-Steves out the back have suffered the same fate, but quite a few have won through and are defiantly waving their rich indigo falls in the breeze. André-Guillaume Darlus du Tailly was one of Louis XIV's 'tax farmers general', private citizens who managed the nation's tax system and ensured Louis was paid his dues. Darlus was born in Paris in 1683 and died there in 1747. He was the son of a wine merchant who supplied the court. His mother was the daughter of a currier (a leather dresser working in the tanning industry). He was appointed as a farmer general in 1726 and like the other dozen or so tax farmers, made a personal fortune. Completely open about his humble origins he often remarked that his grandfather was a simple ploughman. He was regarded as gentle, honest, polite and charitable. 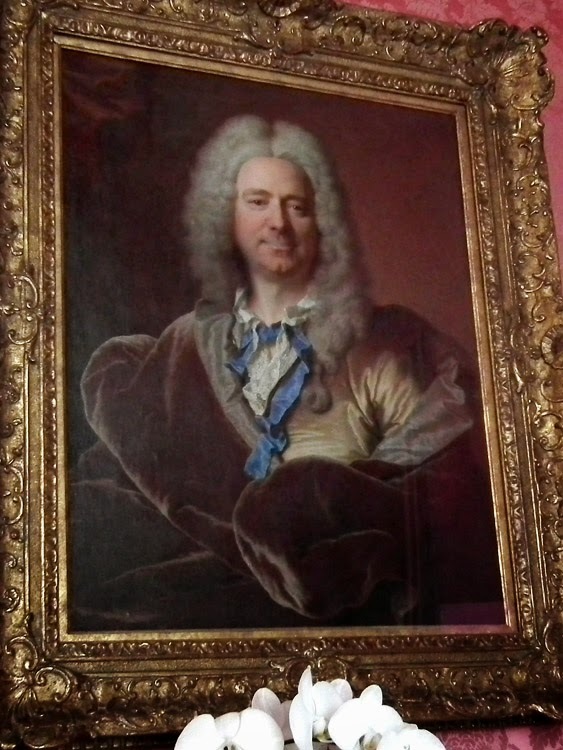 Guillaume Darlus by Hyacinthe Rigaud, Chateau of Cheverny. His oldest daughter Marie-Genevieve-Charlotte married the President of the Paris Parliament, Louis-Lazare Thiroux d'Arconville. 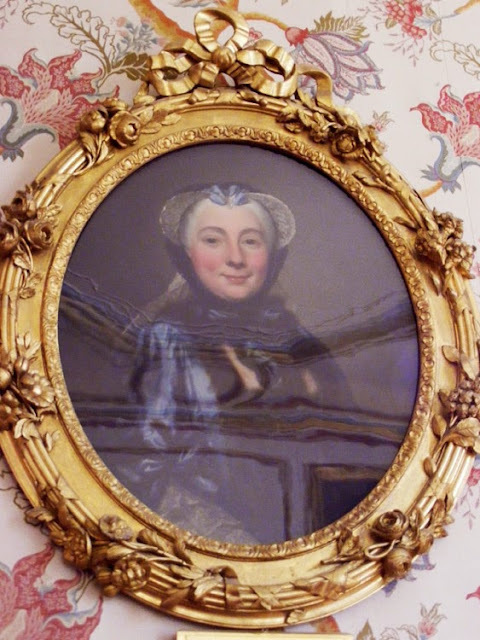 One of his grand-daughters married Louis Hurault, Marquis de Vibraye in 1764 (which is presumably why the Vibraye family home, the Chateau of Cheverny, has his portrait hanging in the house). In 1733 Darlus commissioned a portrait from Hyacinthe Rigaud, the King's favourite portraitist. It cost 600 livres. The entry in Rigaud's account book for the commission notes that Darlus wished to be painted in a rather eccentric mode of dress. He appears very informal, with bare neck and the blue ribbon undone, probably as a reference to his modest background. Rigaud appears to have painted the entire work, rather than passing it over to his assistants after the important bits were completed. My guess is that the two men liked one another, and Rigaud has certainly produced a very fine portrait of an interesting man. 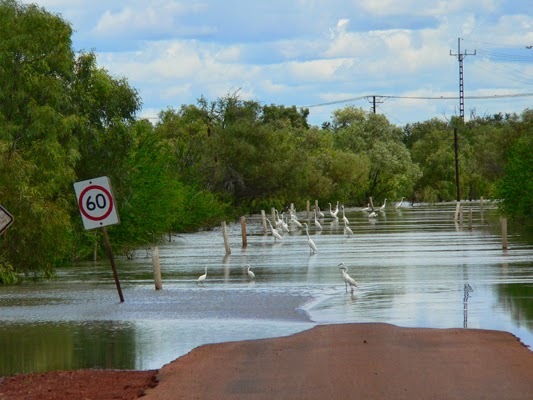 Actually I doubt if it's eels, but these egrets have gathered at a flooded causeway near Newcastle Waters station (ranch) in Australia's Northern Territory to catch fish swept over the road. An intriguing new theory about our property in Preuilly has emerged. On Thursday I spoke to someone who passed on a colleague's thoughts after he had seen the place recently. The back of our barn, with its three 13th century windows (mullions removed who knows when, the central one converted into a door, the right hand one greatly reduced). 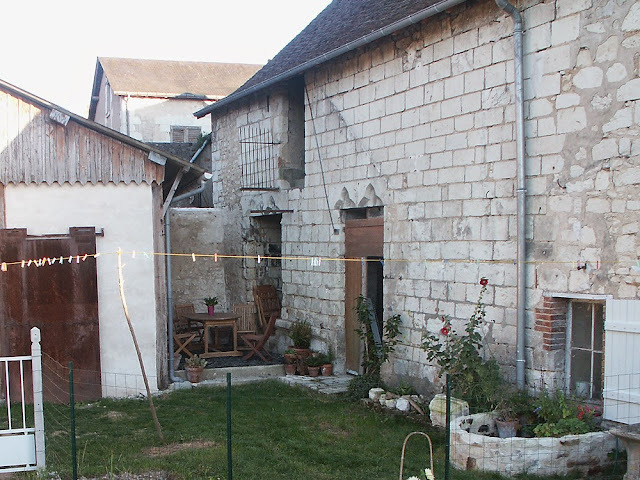 He pointed out that we are hors les murs (outside the walls) of the medieval town, but it is clear our barn was some sort of public or institutional building, not a private building. He has suggested it may have been part of a leper hospital. He felt the large ground floor windows, with their finely carved lintels, would fit this function, as would the position outside of town. Apparently there is a record of Preuilly having a leper hospital. No one seems to have doubts at any rate that it is a 13th century building. My translation: "The church of Saint Nicholas was situated in the suburb of the same name. Proof of this is that the surrounding field still bears the name 'Field of the Cure'. This building, after having been converted into a hospital, passed into private hands well before the Revolution. It is believed that the second designation would have benefitted lepers, and was a clinic, an institution from the 13th century, common to all towns..."
Curiously, our barn is not mentioned at all in this book. I don't think what he says really offers proof that Saint-Nicolas was the leper hospital, but neither would I discount it. We can't find any evidence, for instance, that the field he talks about (presumably the modern plan d'eau) was known as the Champ de Cure. It is not named as such on the 1813 cadastral map. I assume he is indicating that the field was associated with the presbytery, but the word cure has two meanings. It can be either a living (religious) or a treatment for a disease. If the field was known as the Champ de Cure, perhaps the two meanings got conflated somewhere along the line. His sentence about the leper hospital is in rather old fashioned language and I have translated what I think it means, but others are welcome to refine it and let us know. 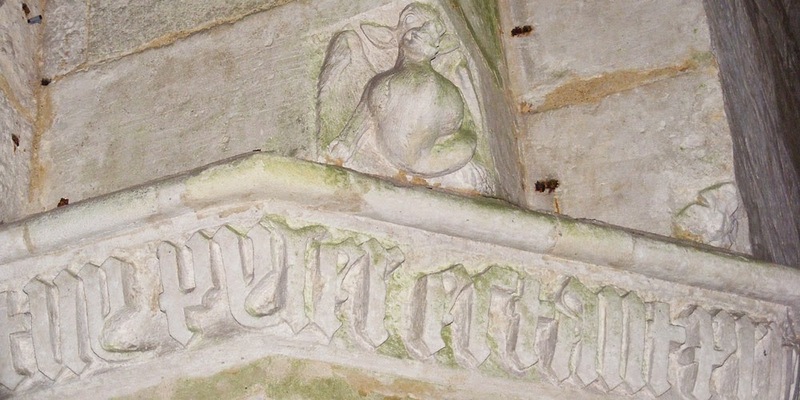 One of the trilobe carved lintels. For an alternative theory on what our property was originally, read this post. Bizarre Presidential Accidents: I know I shouldn't laugh, but today is the 95th anniversary of the date that President Paul Deschanel was found wandering along the track late at night in his pyjamas, after having fallen out of a window of the presidential train at Montargis. You can read a little about this charismatic and eccentric French politician here. 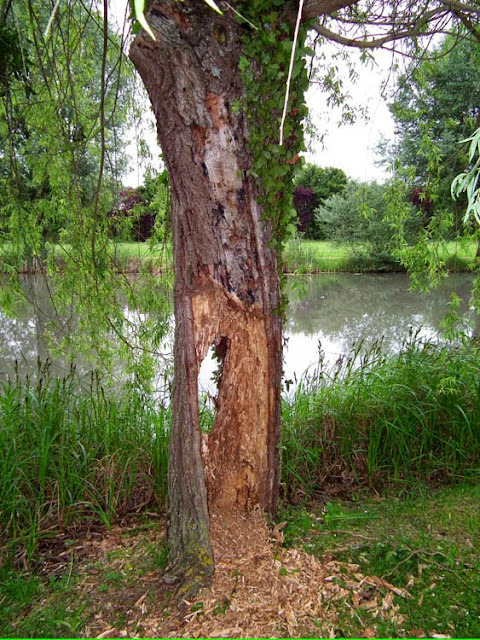 There is an amusing French language account of the incident here. I first heard about him by watching an episode of the French equivalent of 'Celebrity Who Wants to be a Millionaire' on telly. 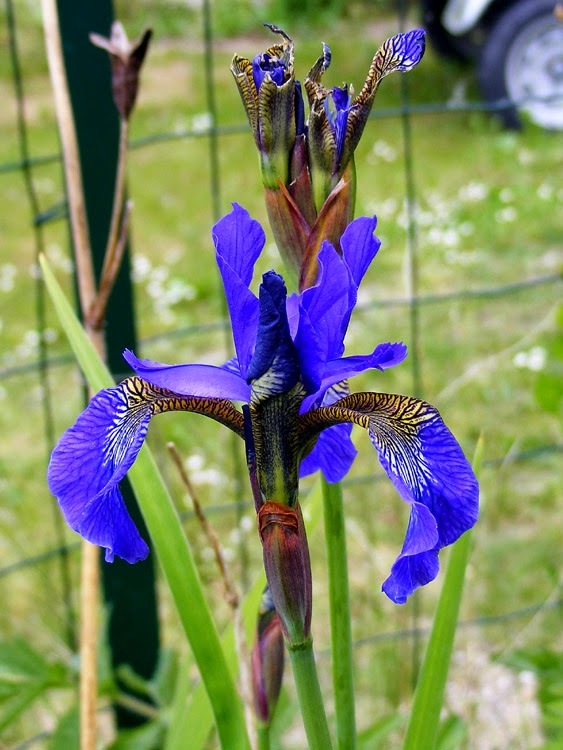 The Puys du Chinonais are so interesting botanically that I thought they deserved a second post. The first one can be read here. 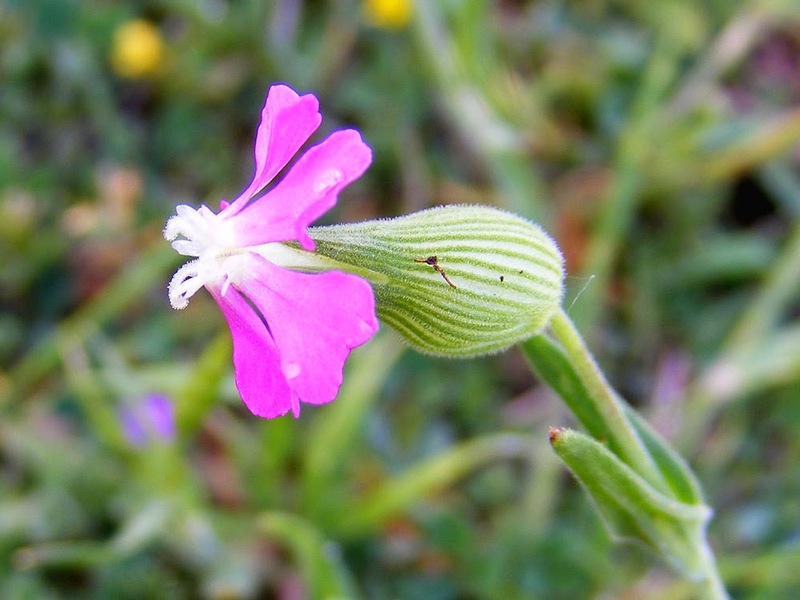 The reserve has species which are only found on sandy sites, such as Sand Catchfly Silene conica. one of the common stonecrops on the site. Horseshoe Vetch Hippocrepis comosum also on site. This Broomrape Orobanche sp was growing right next to Field Eryngo Eryngium campestris (Fr. Panicaut) and digging the plant up proved that it was parasitising the Field Eryngo, thus establishing that it was the rare and localised Sand Broomrape O. arenaria. Without digging it up we could easily have assumed it was the equally rare Thyme Broomrape O. alba as Breckland Thyme Thymus serpyllum (Fr. Serpolet) is everywhere on the site, scenting the air in a most delicious way when you inevitably step on it. François' top tip for identifying wild thymes is: Breckland = round stems hairy all over; Large (T. pulegioides) = square stems hairy on the angles; Wild (T. polytrichus) = square stems hairy on the faces. Sand Broomrape, showing the root ball. 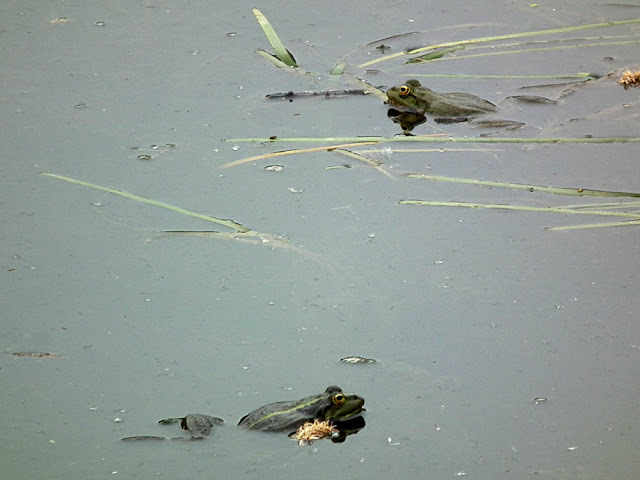 The site is managed to maintain populations of certain 'star' species. This pile of grass clippings acts as habitat for reptiles and small mammals, but is there because this section of the site must be mowed and the clippings raked up to keep the rare Pasqueflower Pulsatilla vulgaris thriving. 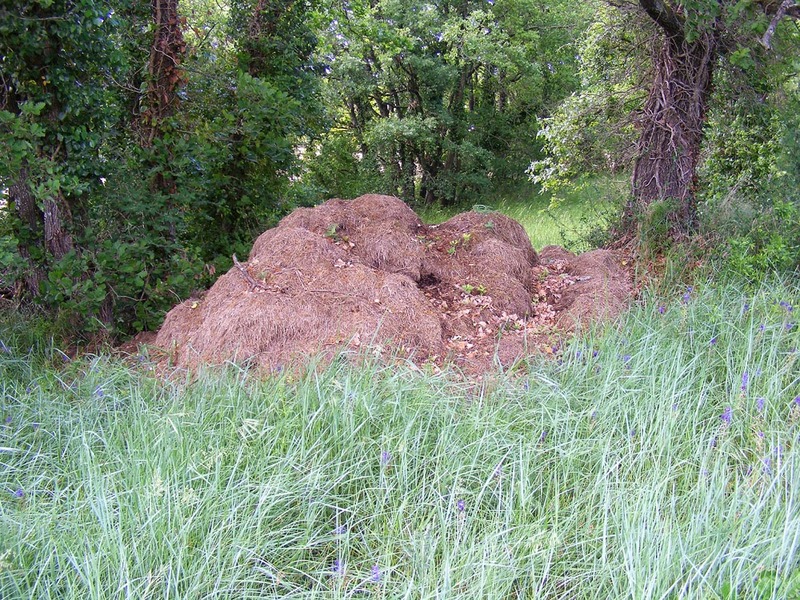 Ideally the site should be grazed instead, but managing it has proved impossible so far. 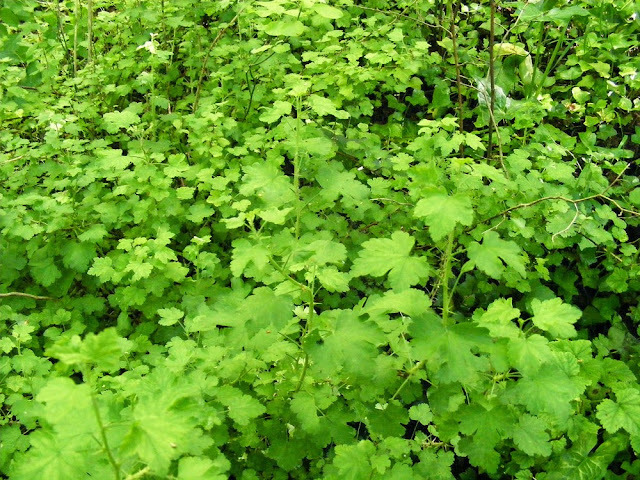 To my considerable surprise there is a large patch of wild Gooseberry Ribes uvo-crispa and Red Currant R. sanguineum growing in the woodland section. I was assured that this is a genuinely wild population, not garden escapees, and that the two species occur in many cool shady places throughout the Touraine. It never fails to amaze me how many plants one can find here growing wild that have been adopted by gardeners world wide. 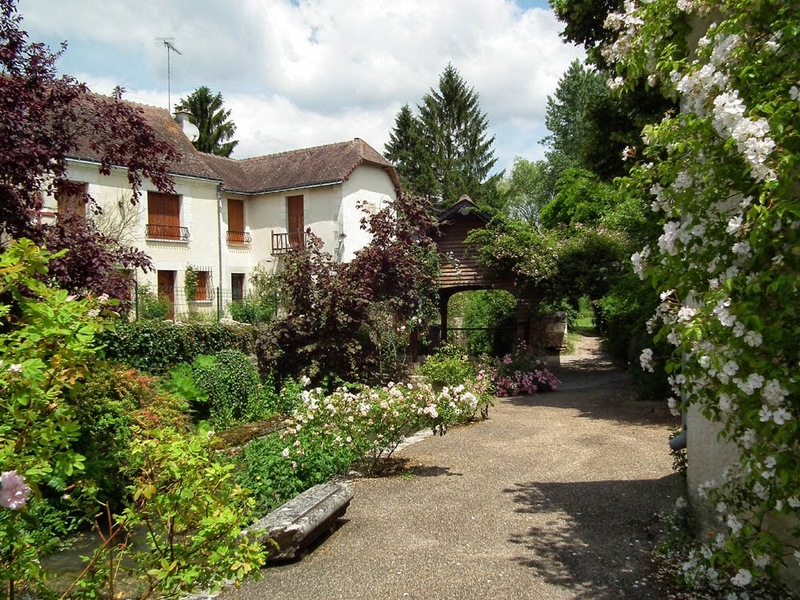 The Touraine is truly the garden of France. 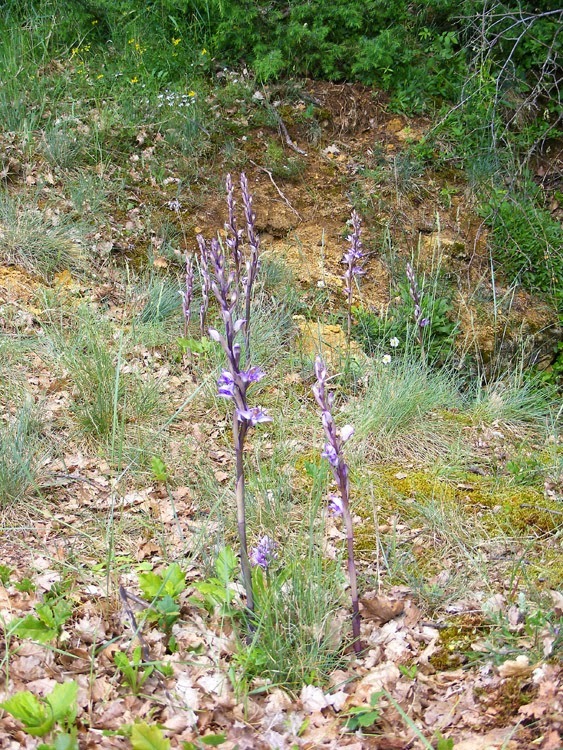 Thursday 14 May was a public holiday in France so the Association de Botanique et de Mycologie de Sainte-Maure-de-Touraine and the Société Botanique Ligérienne organised a joint outing to survey the flora of the Puys du Chinonais for the Conservatoire des Espaces Naturels, who manage the site. We've been there before, but it is such a rich botanical area that it is always a pleasure to go again. 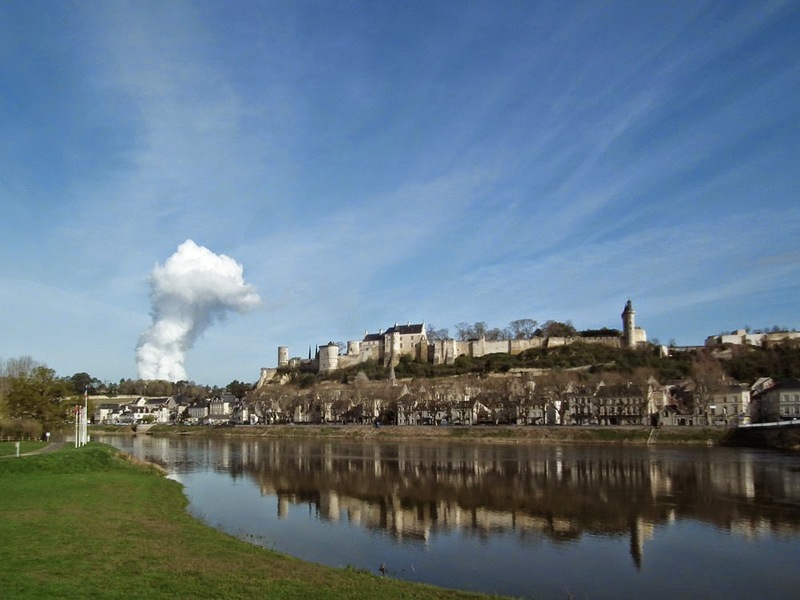 Twenty or so botanists gathered in the carpark by the fire station on the edge of Chinon and then we set out in convoy up into the low hills to the north-west. The Puys are a series of hard limestone ridges with sloping sandy sides, criss-crossed by a confusing grid of dirt tracks. You have to know where you are going to navigate through the vineyards and gypsy encampments to get to the nature reserve. Vineyards come right to the edge of the reserve. Once there, the botanising started immediately, in the carpark, with some charming little pink Sand Catchfly Silene conica (Fr. Silene conique). It is only found on sandy ground. The next plant of interest was the fine grey green leaves of Seseli montanum (Fr. Séseli des montagnes). It will flower in July so at the moment it is just foliage a bit like carrots, to which it is related (one of its English names is Moon Carrot). A little later we come across another rare and protected umbellifer, Honewort Trinia glauca (Fr. Trinie glauque). It is flowering, looking a bit like tiny florist's baby's breath. Already a pattern is emerging. This site is full of plants that 'shouldn't' be here. They 'should' be at the beach or in the mountains or much further south in the heat and dry. That's what makes the site so interesting -- all these species that are unexpectedly present and thriving, and a significant number of rarities too. 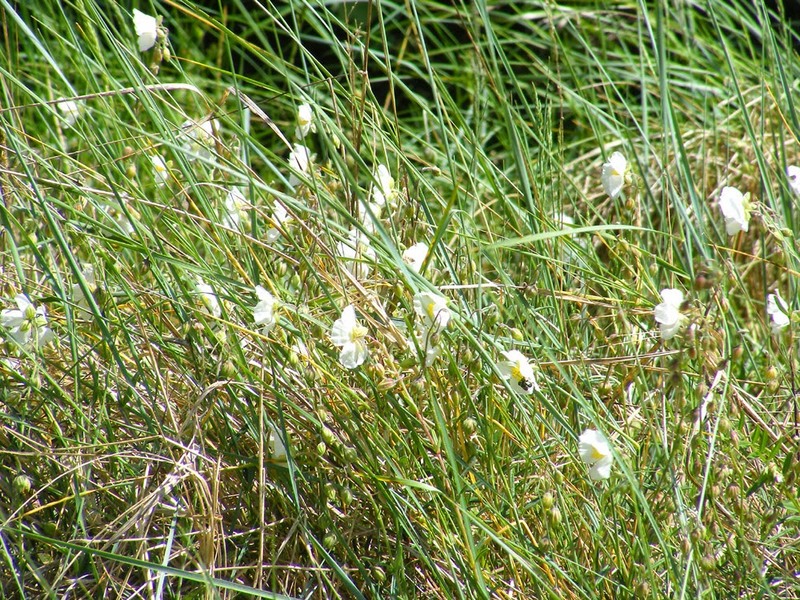 White Rockrose in the grass. 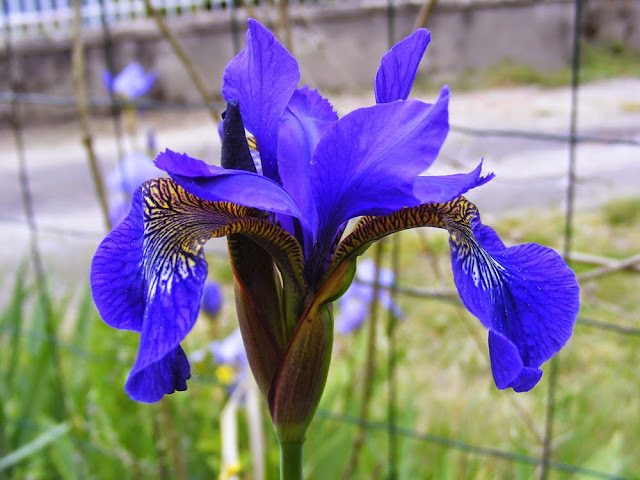 There are also plants which provide food for insects with very particular tastes. 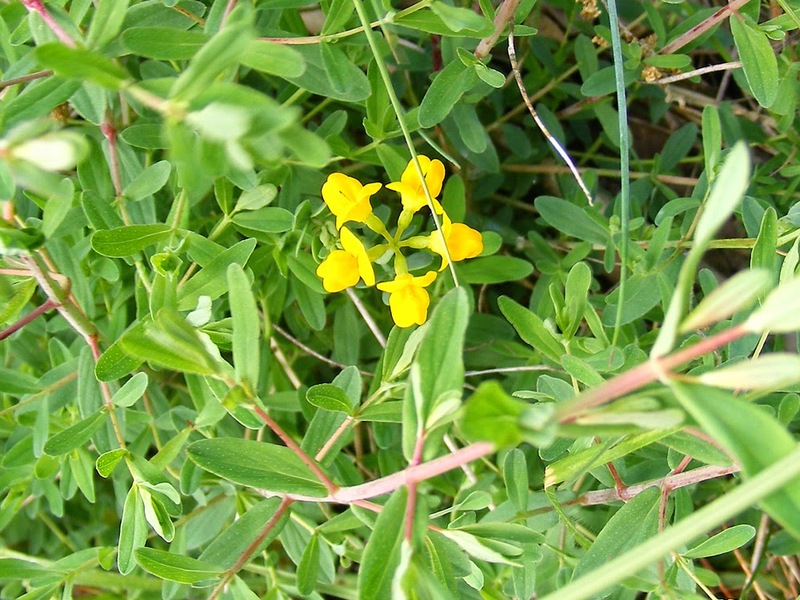 The ground is covered in places with Horseshoe Vetch Hippocrepis comosa (Fr. Hippocrépide à toupet). This is the larval foodplant for the beautiful Adonis Blue Polyommatus belargus (Fr. le Bel-Argus) butterfly, and the small irridescent blue males are flitting about everywhere. The presence of these two species tells you that the substrate is dry and calcareous. If it wasn't they wouldn't be here. 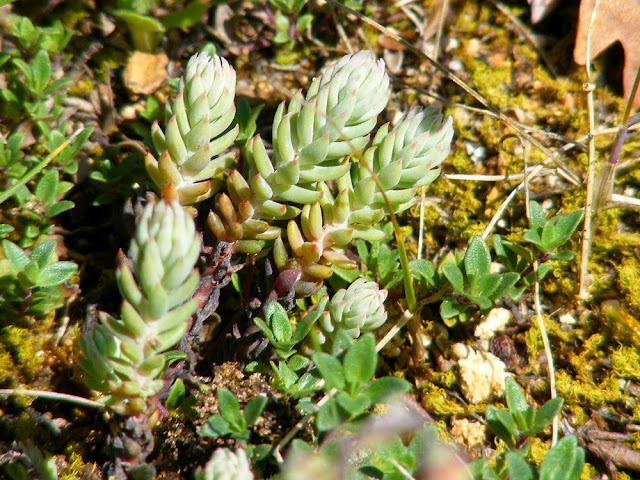 We encounter several species of Sedum, some ubiquitious, some rare, and Rockroses of several species. 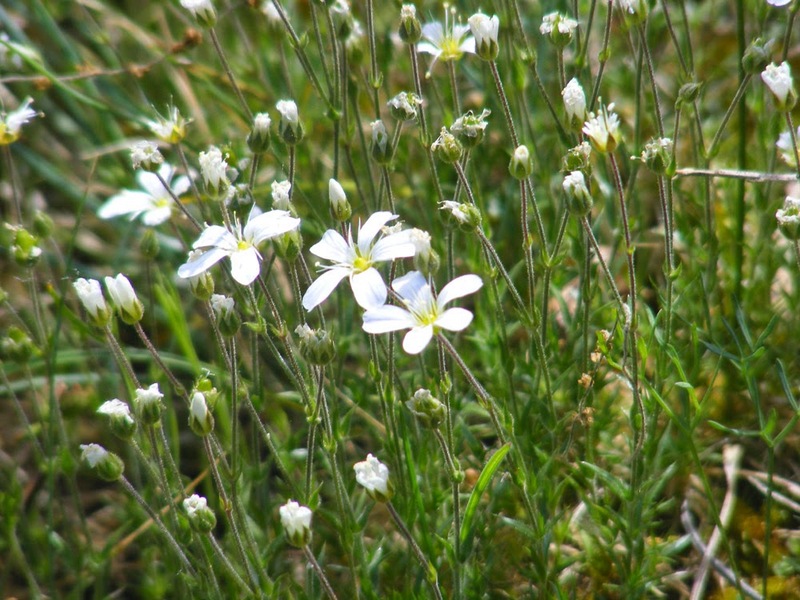 The White Rockrose Helianthemum apenninum (Fr. Hélianthème des Apennins) is everywhere in the grass, the yellow flowered Hoary Rockrose H. oelandicium (Fr. Hélianthème des chiens) is much smaller and restricted to exposed rocks in the ground where it clings on with apparently no soil. Arenaria grandiflora (Fr. Sabline à grandes fleurs) is a pretty white flower with greyish leaves that would grace any alpine garden. It is found in isolated pockets from the Mediterannean to Fontainebleu. A national study and survey to determine the genetic variation of the species discovered that the Tourangelle plants and those at Fontainebleu are the same. Given how isolated each population is, this was a bit of a surprise. As we progressed through the site, François Botté, who was leading the outing, pounced on plant after plant. For each he had a tip to aid identification or a story about some interesting research. The genus Globularia has been reclassified into the Plantain family and our local species is no longer G. vulgaris (now restricted to plants in Siberia) but G. bisnagarica (Fr. Globulaire allongée). The protected species Violet Limodore Limodorum abortivum (Fr. Limodore à feuille avortée) is a parasitic orchid which instead of photosynthesising takes its nutrition from the mycellium ('roots') of Brittle Gill Russula spp fungus, which in turn are in a symbiotic relationship with surrounding trees (taking carbohydrates in exchange for certain micro-nutrients). 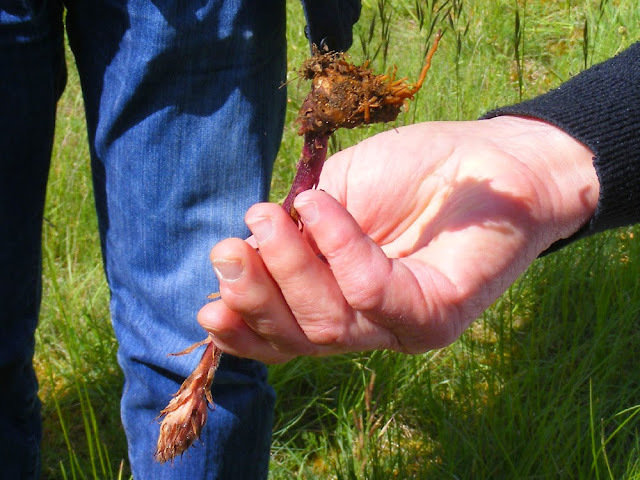 Broomrapes Orobanche spp, on the other hand, wrap their root ball around their host and subsume their roots. 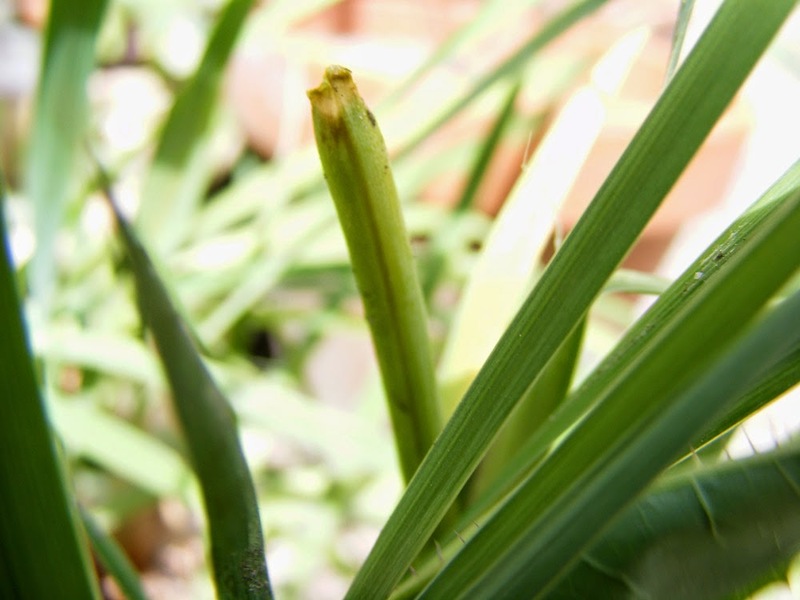 To accurately identify an Orobanche it is necessary to dig the plant up and see what it is actually connected to (François deployed the tip of his umbrella for this task). None of the available identification keys are reliable in all cases and identifying an Orobanche by guessing that its host plant is what is growing next to it or by matching it to a picture or photo is also not reliable. A colony of Violet Limodore. We also got tidbits like old wheat fields (presumably with specimen oak trees present) were once the best sites in the Touraine to find truffles, but now these fields have had 50 years of fungicide there is no chance of finding good truffles in the wild. We found a Scarce Swallowtail Iphiclides podilirius (Fr. le Flambé) and François told us they and their cousins the Swallowtail Papilio machaon (Fr. le Machaon) are both declining because of habitual disturbance (ie gardening or farming) to their larval host plants such as carrots and plum trees, and because the adults are commonly hit by cars. Field Pepperwort Lepidium campestre (Fr. Bourse-de-Judas) has seeds that look like old fashioned tractor seats according to François. He didn't make anyone taste it, but he did offer me and some others some Clematis flammula (Fr. Clématite brulante). Boy was it peppery! Apparently in the south of France it was eaten in the old days. Later we came across a patch of wild Gooseberry Ribes uva-crispa (Fr. Groseillier à maquereau) and Red Currant R. rubrum (Fr. Groseille à grappe). Sadly the berries were well green, so no opportunity to sooth our zinged out tongues! 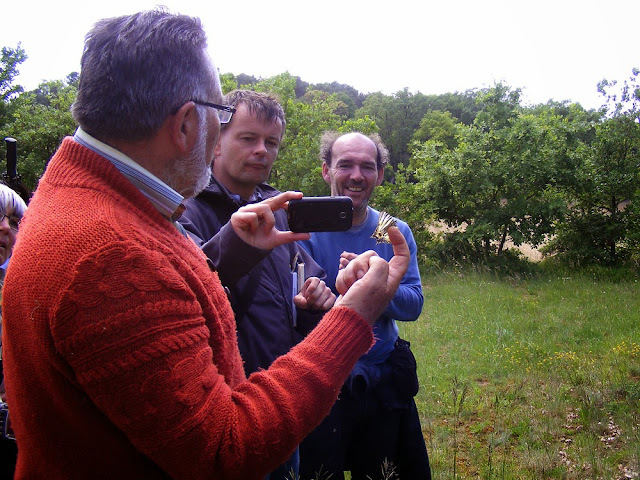 Photographing a very co-operative Scarce Swallowtail resting on François' finger. We saw 8 species of orchid in flower on the site and caught the last of a special patch of Pasqueflower Pulsatilla vulgaris (Fr. Anémone pulsatille) still out. The pompom seedheads were testiment to how many had flowered earlier in the season. All in all a thoroughly top notch nature reserve, tucked in between a medieval fort and a nuclear power station and surrounded by vines. 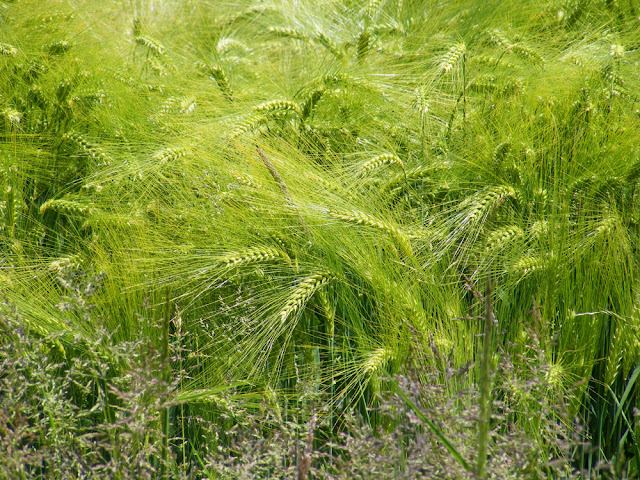 By late May the barley in the fields here is turning whiskery yellow and easy to distinguish from the wheat. It seems to me that farmers here grow as much barley as wheat, but before the ears start to form, I can't tell the difference. The barley is grown as stock food and will be harvested in July after the canola but before the wheat. The farmer will alternate the crop with sunflowers or maize. Barley is a beautiful crop, rippling and undulating in the wind. I much prefer it to canola, which is ugly and smelly for most of the season, or even sunflowers, which have a much shorter season of glory. French Expressions: Mon ancienne voiture = my previous car; ma voiture ancienne = my classic/vintage car; ma vieille voiture = my old car (as in aged). That's right. 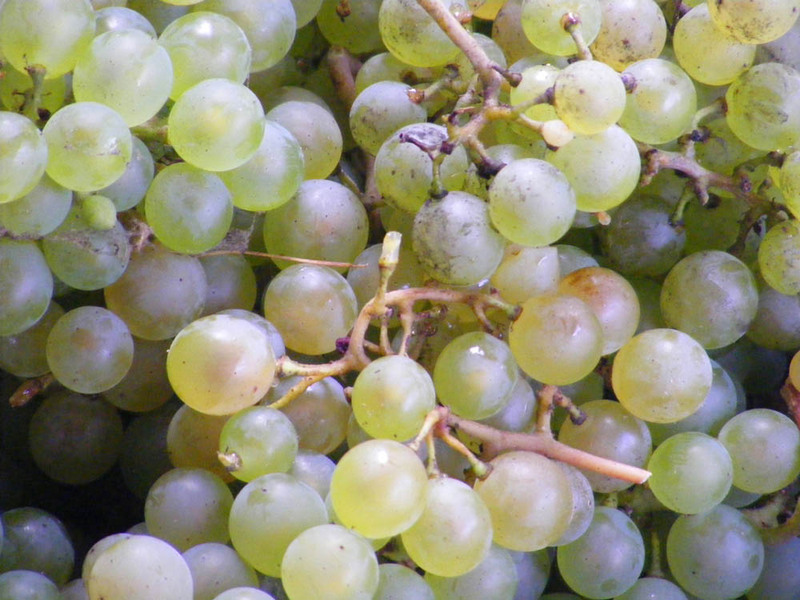 Grapes don't need insects for pollination. They mostly self-pollinate. Black Hamburg table grapes in our orchard (September 2011). That's why grape flowers are inconspicuous, unscented and many don't offer nectar. 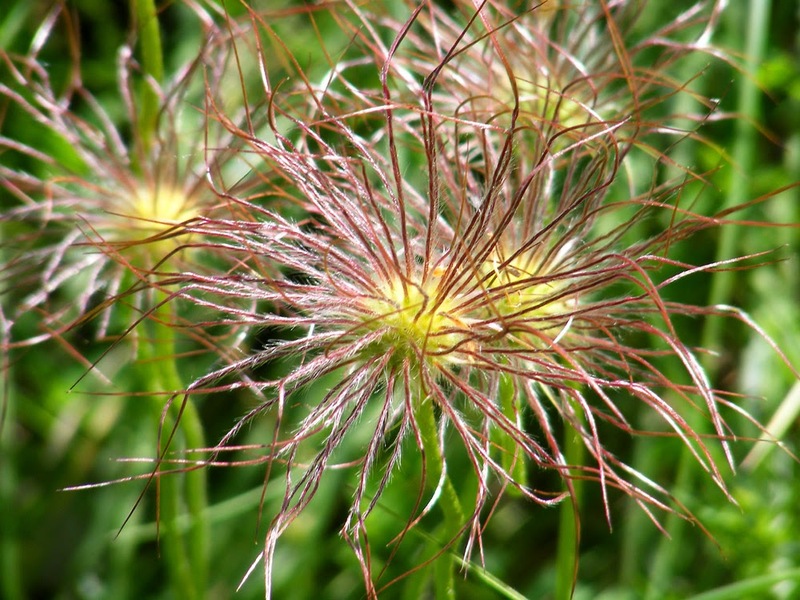 They can be wind pollinated if the weather is right (dry with a breeze but not raining and blowing a gale), and some varieties rely quite heavily on wind pollination. If insects visit the flowers they can provide some pollination, but no grape vine species or varieties depend on insects. 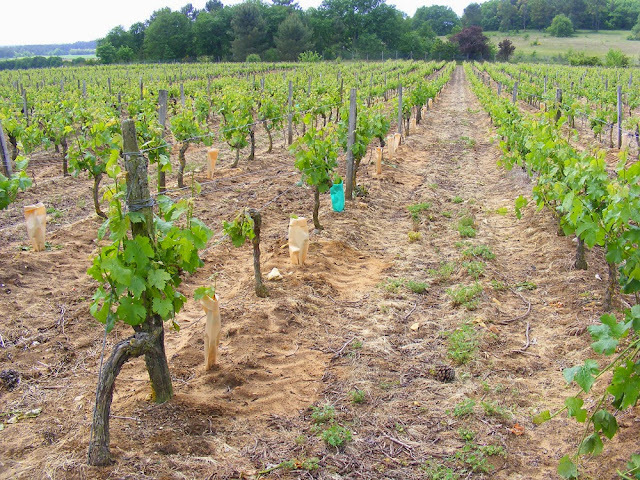 The weather has considerable influence on how successful grape self-fertilisation is. 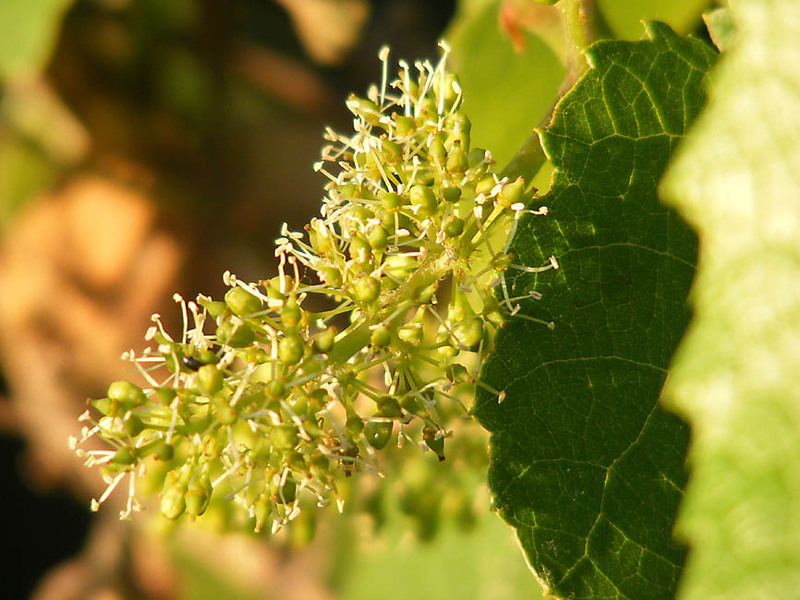 If it is cold, wet or windy grapes don't flower well or not all the flowers in a cluster will fertilise, thus leading to small or patchy bunches. Grape flowers at the end of May 2011 in our orchard. By the end of May fruit is setting, with the fertilised flowers producing tiny green ovoids that will become individual grape berries. 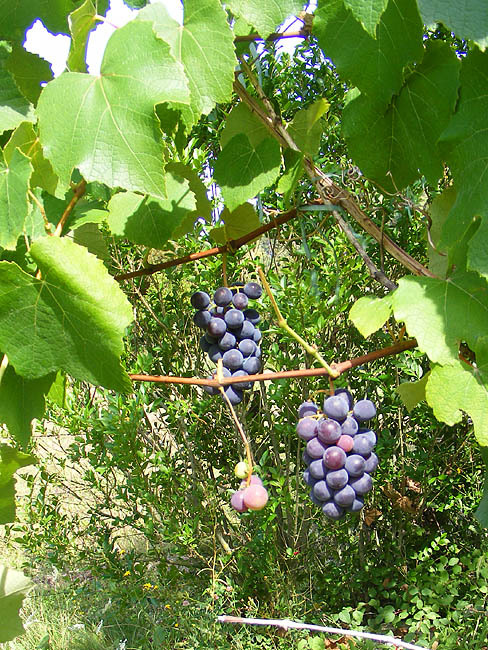 All wild grape species have black fruit. Green grapes are the result of breeding and mutations which 'switch off' the the production of anthocyanins (red-blue pigments). 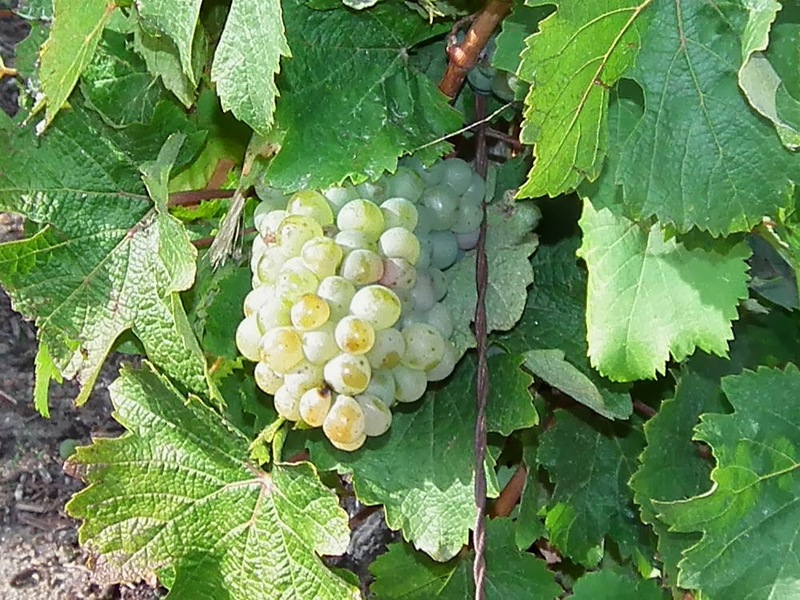 Chenin blanc grapes, not quite ripe yet, Vouvray, October 2013. 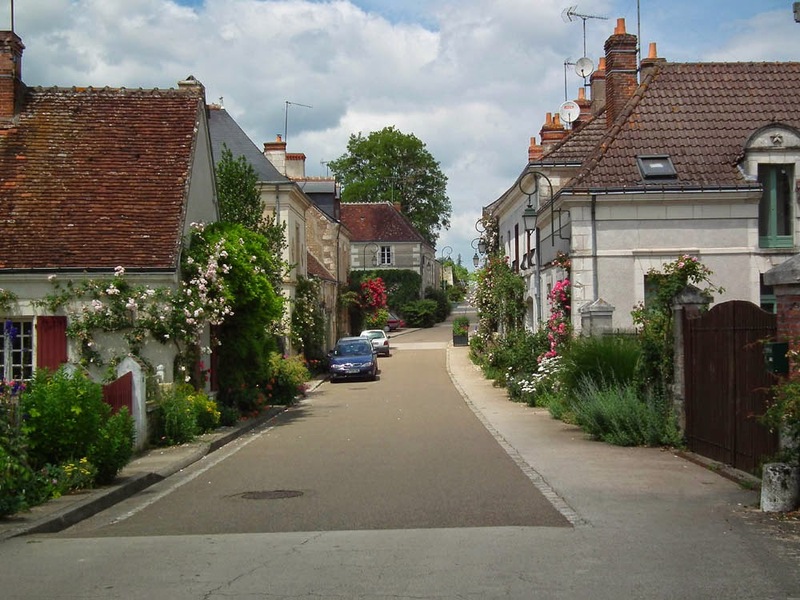 Chédigny is an impossibly picturesque village near us. The best time to visit is the end of May to the beginning of June, when the roses are at their absolute best. 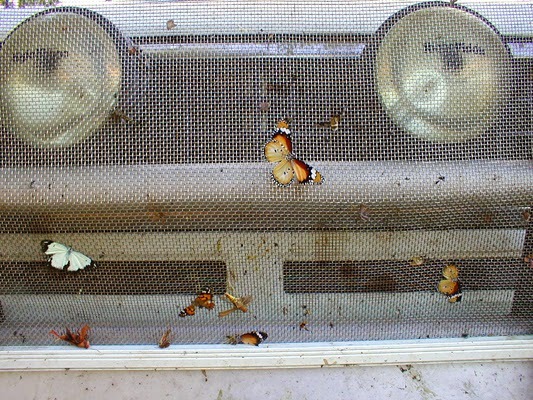 The front of my father's 4-wheel drive, covered in insects. A week or so ago we had dinner with our friends Tim and Carolyn at their place in Amboise. 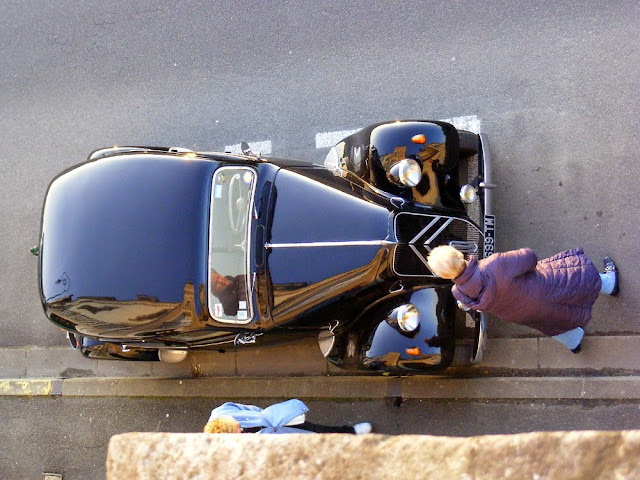 We parked right outside their house, a listed building and B&B which sits between the Chateau of Amboise and the Loire River, and I thought it would be amusing to photograph Claudette from upstairs. This is the sight that greeted Simon as he leant out the window with the camera. 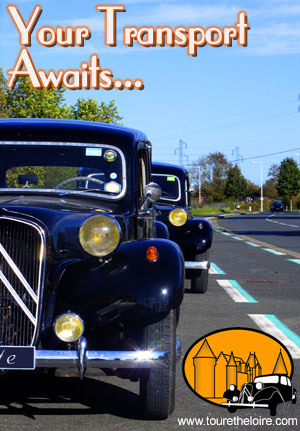 Classic cars attract attention wherever they go and people are particularly delighted to see iconic French vehicles in working order out and about on the roads. These two women had a good nose around Claudette, peering in the windows and admiring her for several minutes before they walked on. Those of you used to more equatorial latitudes may be interested to know that this photo was taken at 9.20 pm. 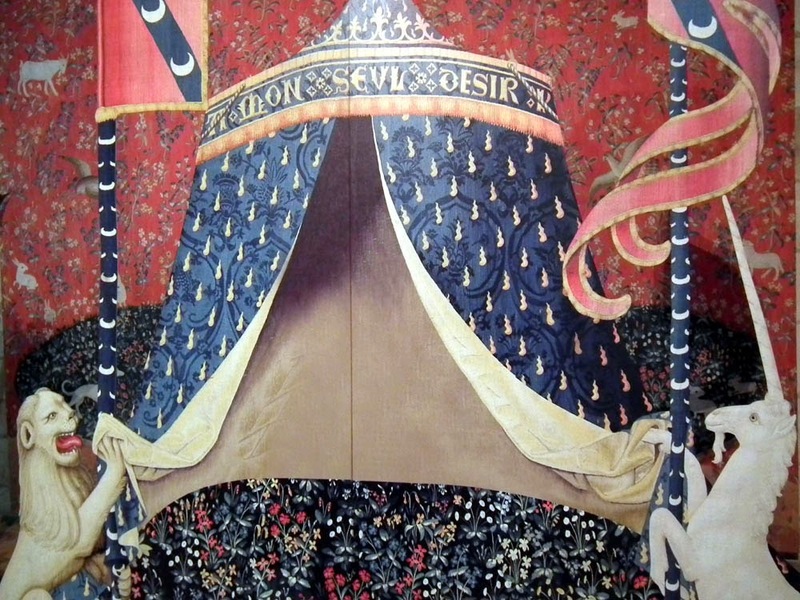 This painting, which currently hangs above the entrance to the cloisters in the cathedral in Tours has had a rather unexpected recent history and caused a bit of a kerfuffle. In 2010 the 17th century 4 metre wide by 1.9 metre high Flemish painting depicting the conversion of Saint Paul was restored. It had been discovered in a storeroom four years earlier by a young man working as a sexton. At the request of the senior architect from Historic Monuments, he was clearing out old furniture in the storeroom, to facilitate access during upcoming restoration work on the facade of the cathedral. When the painting was put on public view in 2012 he claimed ownership rights to the painting! His argument is that the painting had been totally ignored and forgotten, despite its artistic value and so far as I can ascertain there is an ongoing legal dispute. When rediscovered in 2006 by him it was leaning against the back of a heavy freestanding cupboard, amongst planks of wood and material that was destined for the rubbish tip. 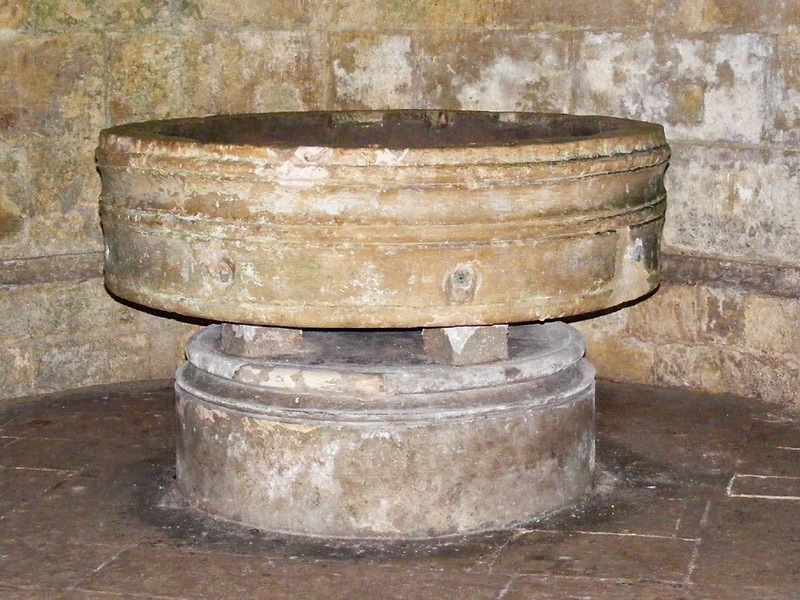 It had probably been there a very long time, as it was filthy and not listed on the cathedral's inventory of 1906, at the time of the introduction of the law to formally separate church and state. It had presumably been missed, either because it was already in the storeroom and so covered in dust that its value wasn't appreciated, or because it was deliberately hidden by the priests just prior to the inventory. 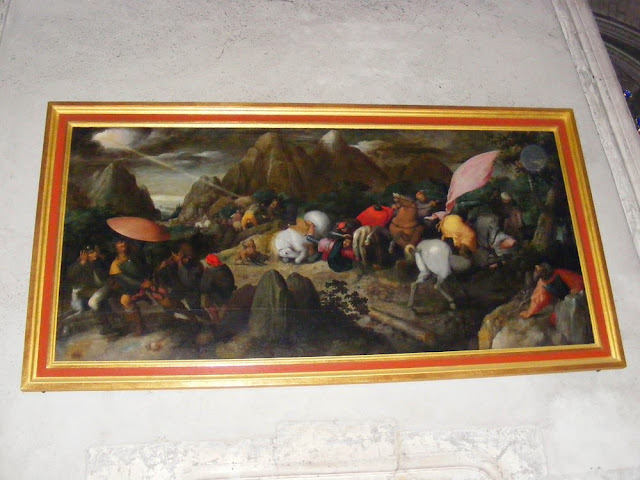 The sexton alerted the curators to the existance of the painting and according to him, heard no more about it until one day he saw it, fully restored and hanging on the wall of the cathedral. And this is really the heart of the matter - the young man feels as if he has not been treated with the respect he deserves. The sexton's claim is based on Treasure Trove law, and the fact that he came upon the valuable work by accident. If his claim is upheld he is entitled to half the value of the painting. The DRAC (Department of Culture, who own and manage the cathedral) on the other hand, is countering by pointing out rather bluntly that possession is nine tenths of the law. The DRAC curator says that the painting was neither hidden nor buried, so Treasure Trove doesn't apply. His view is that the painting was simply stored, and the sexton was directed to clear the room in the course of his day's work, so the discovery was not really accidental. Thus the painting's status is just like the other furniture in the room. He thinks the painting is part of the heritage of the cathedral and therefore clearly belongs to the cathedral. Also he points out that it was the DRAC who recognised the interest of the painting and acted to restore it. The restoration and reframing cost €30 000 and it was only after the restored painting was hung in public that the sexton made his claim. Gilles Blieck, the curator, hopes that common sense will prevail and you can sense his exasperation when he is quoted in the newspaper articles. 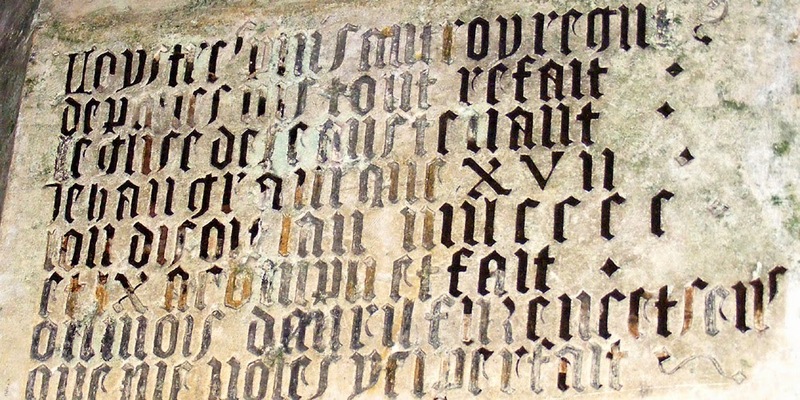 Treasure Trove law crops up from time to time in France and invariably causes a controversy. 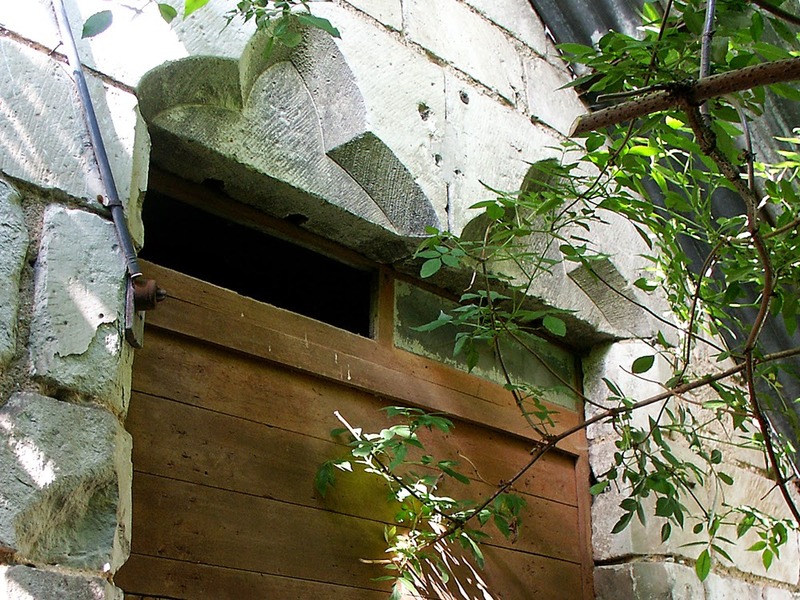 The best known cases have involved masons discovering hoards of gold hidden in walls. The finder of such treasure on someone else's property can claim half the value and it is on this basis that the sexton is claiming. For his claim to be upheld certain conditions must be met: the find must be down to chance; the treasure must be hidden or buried; and there must be no clear and/or established title to the treasure. Cask wine, as it is known in Australia, has been widely adopted in France, where it is known as bag-in-box. In Australia it is generally negatively regarded as cheap and poor quality, but it never acquired that stigma in France. Here it is seen positively as a cheaper and practical alternative to bottles for mid-range wines which are intended to be drunk young. In other words the sort of wine that many people here drink every day and the sort of wine that restaurants use as their house wine. Many local wineries package their most popular wines in both bottles and boxes. The sauvignon blanc in the yellow boxes below is exactly the same prize winning wine as the bottles you can buy from this winemaker. 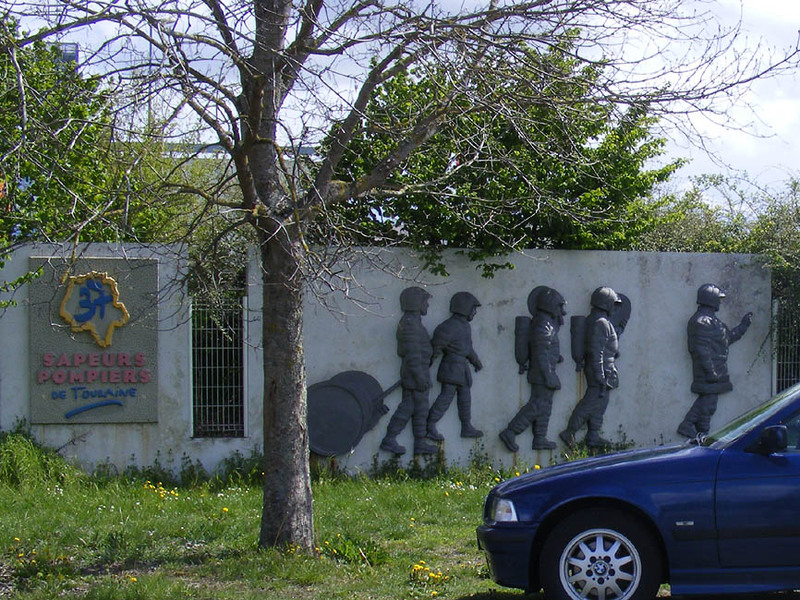 Christophe Davault's Domaine de la Chaise winery in Saint Georges sur Cher. Consumers appreciate the lower price and the practicalities of storage, transport and lower weight. They like the fact that the wine has a long lifespan after the box is opened, because the wine remains protected from the air. Restaurants appreciate the ease of use and the fact that staff don't have to open numerous bottles each service. 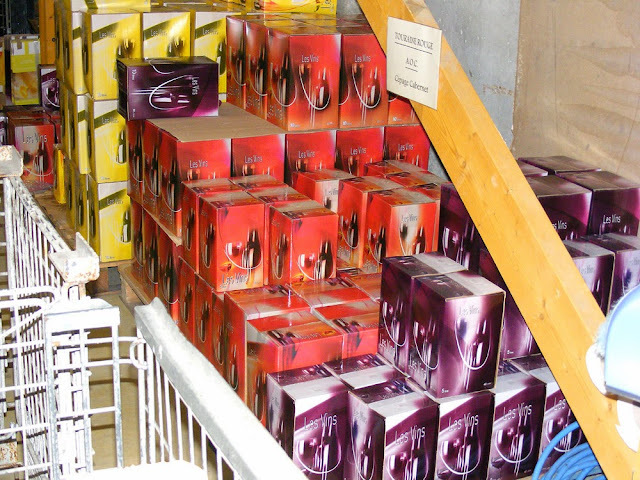 Boxes come in 5, 10 and 20 litre sizes and are openly used behind many local bars, at functions and in private homes. Forgot to mention: Claudette passed her CT (Contrôle Technique) on Monday with no problems, the only advisory was a cracked steering rack boot. The brakes are really good: I knew that from using them, but the balance is nigh on perfect (the déséquilibré is in single figures) and the new Koni shock absorbers are spot on too. Well done Jean-Louis! 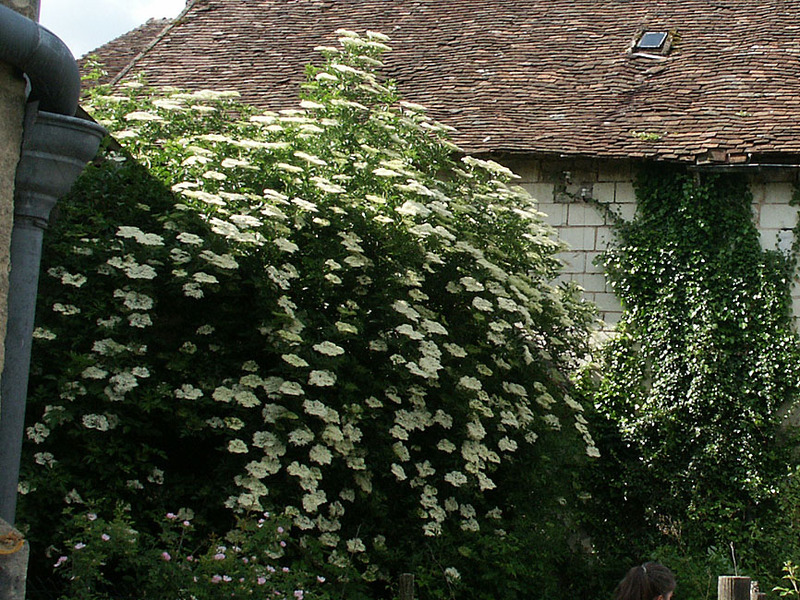 Elder Sambucus niger is a common small tree in the Touraine. 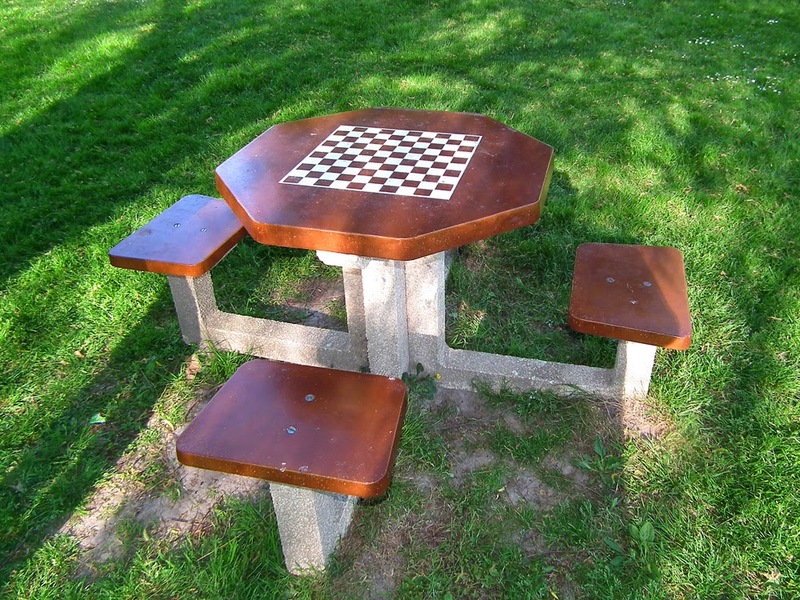 The wood is soft, so it doesn't have a commercial value. But from May to early July elder produces gazillions of tiny creamy white flowers held in flat clusters all over the tree, fragrant and smothered in yellow pollen. The flowers have been used as part of the suite of ancient herbal remedies in Europe for centuries, for coughs and colds. Modern research suggests that they may indeed be effective against sinusitus, and can lower blood sugar. 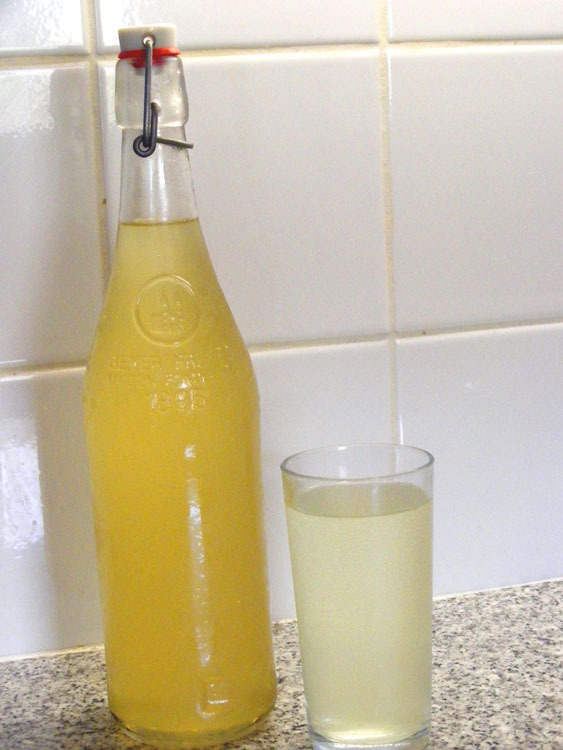 The flowers can be used to make a subtle but delicious variation on lemonade. Pick them while they are at their peak, and have plenty of pollen still. My recipe for elder flower syrup is here. You can bottle it as above or freeze it in icecube trays and use it from frozen (this brilliant suggestion comes from our friend Roger). 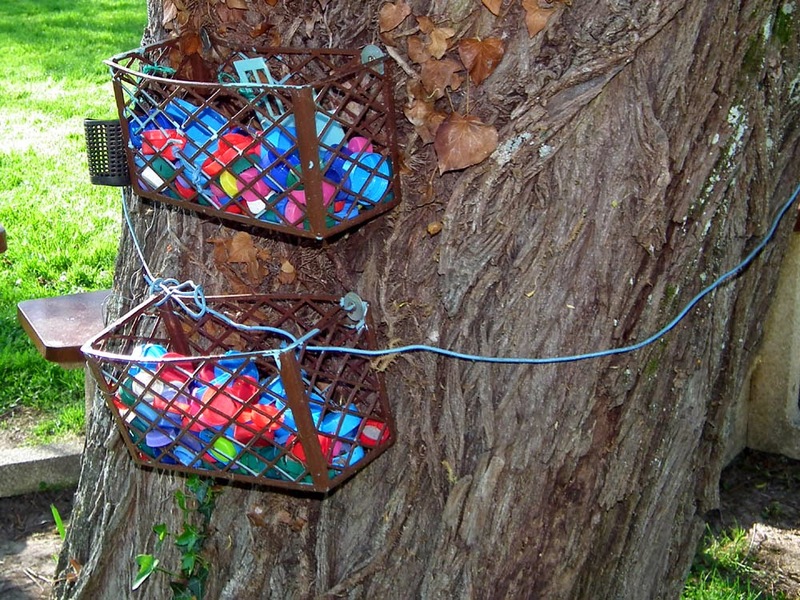 We were recently in Montrésor and Simon was intruiged by the clothes peg baskets full of bottle tops wired to a tree. Many thoughts crossed his mind (he is like that...) none of them either practical, relevant or sensible. Until he looked around and noticed the setting. Under the same trees are seats and picnic tables with strange markings. Suddenly it made sense. After returning home from a very pleasant apero with Tim and Gaynor (combined with picking up plunder - cheese, car oil, the usual sort of thing) we had dinner, then Simon settled down to watch a program about comets on the TV. Something provoked him to wander outside to see if there was any celestial action. 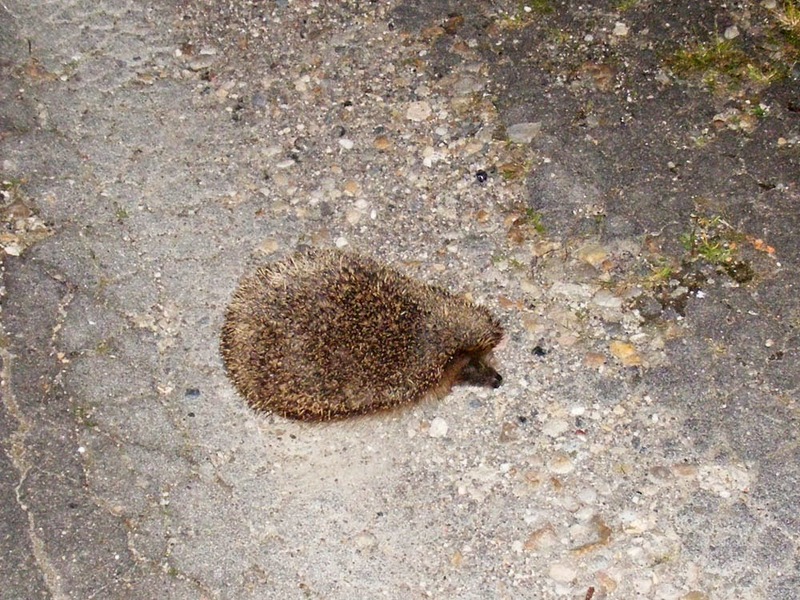 He strolled back in (actually, he didn't, he burst back in) to the house and said "I think I have kicked a hedgehog". Sure enough, on investigating with torches we discovered a very put upon looking hedgehog in the driveway. What amazes us is that in 9 years we have never seen any sign of hedgehogs around the house, yet Simon immediately assumed that's what he had done. It may have to do with having a bobo on his toes (naturally he was bare footed), because nothing else around here is that prickly. An hour later there was no sign of the hedgehog, Simon's toes had stopped hurting (it felt like the world's weakest nettle sting), and our driveway had returned to it's normal, peaceful state. The church of Saint Eutrope in Saintes is a curious basilica style building that is sort of a church on top of a church. 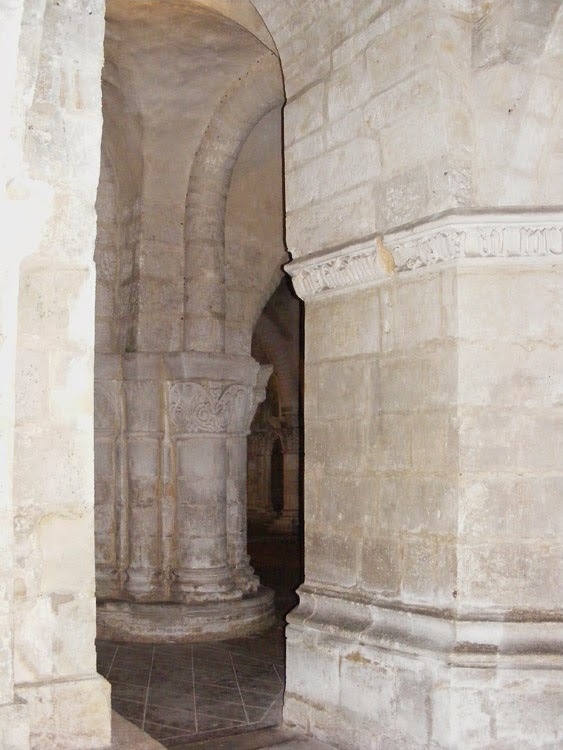 The early 11th century crypt is large, atmospheric and virtually empty, and is mirrored by the slightly later church above. Once this lower church was for the general populace, whilst the upper church was for monks only. 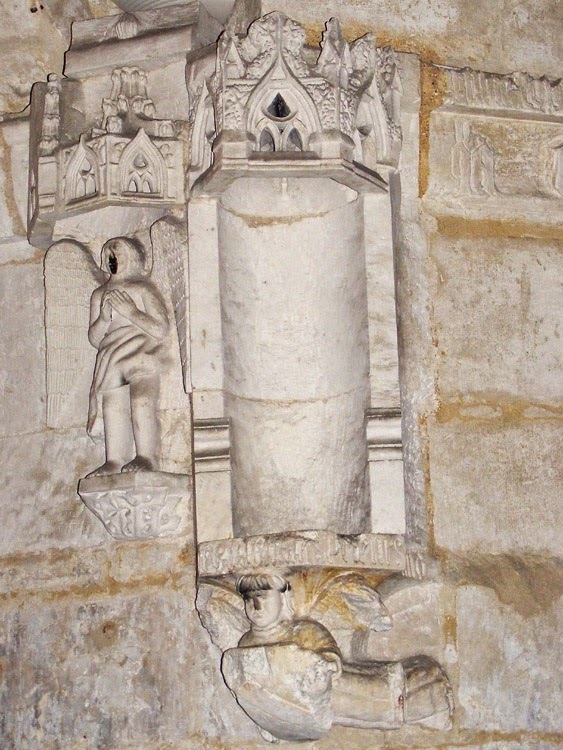 It is one of the most outstanding monuments of the Romanesque period in France and is on the major pilgrimage route that ultimately leads to Santiago de Compostella. 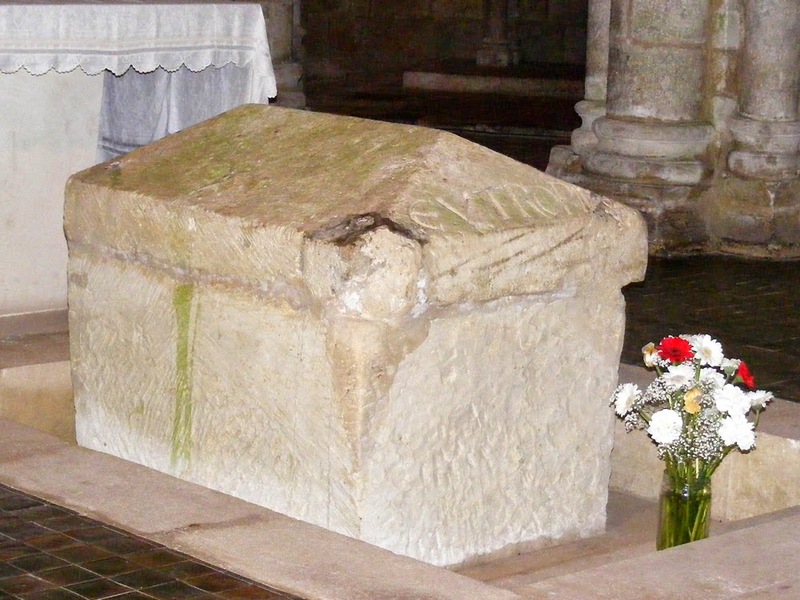 The sarcophagus of Saint Eutrope. 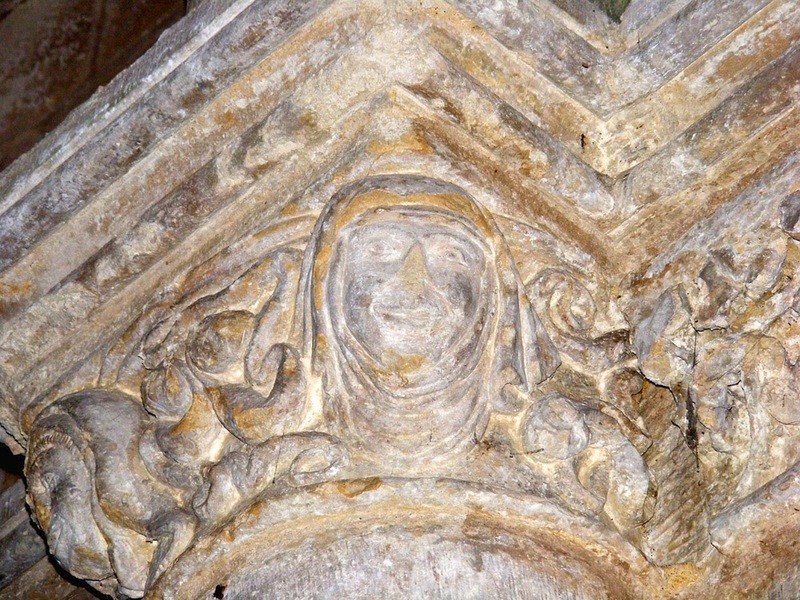 Medieval dames adorn one of the capitals. just above head height, supported by rather tough looking angels. Looking down one side of the ambulatory. The disk shaped arch voussoirs are distinctive. 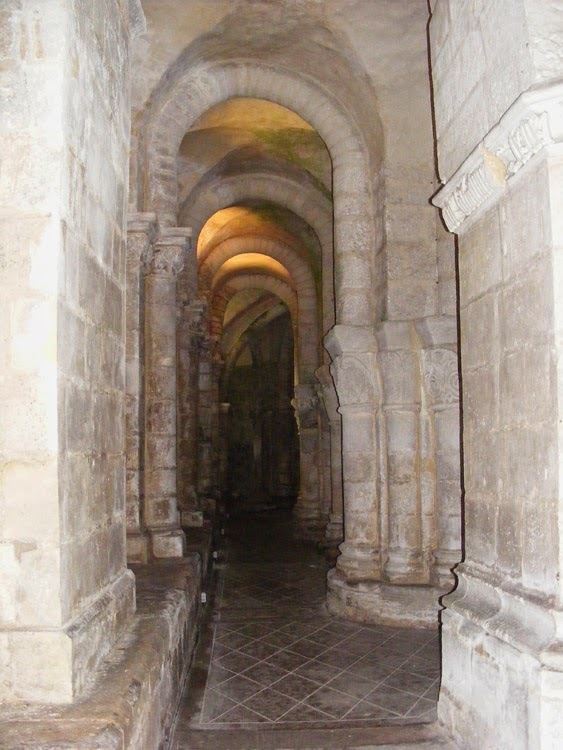 All photos taken in the so-called crypt, or lower church. Claudette is off to have her CT (roadworthy, MOT, whatever) today. This is a bi-annual event that I always find quite stressful. We have checked the headlights, indicators, tail lights, stop lights, fog lamps, and we know she stops and starts. At home. A la cuisine hier: Eggs Florentine, using some of the bucket of chard I harvested. The rest I steamed and froze in batches. Sort of Oriental style chicken, made with pieces of cockerel and leftover soy sauce / pineapple juice marinade. Carrot, celery, red pepper and baby corn added and served with rice. First rhubarb of the season, from the market, stewed, and homemade custard.